With Clark Kent’s (Superman) birthday often celebrated on June 18 (kryptonite cake, anyone?) why not use that day to explore some aspects of superheroes with your kids. Whether you only have time to share a short passage from a book, or you’re looking for all sorts of activities to include in a unit, I have some educational and fun ideas for parents, teachers and librarians to try with kids. Any one of these might serve as a prompt to further creative activity or learning, depending on what suits a child best. * Children love superheroes; adults do too. How many superhero characters can you name? Write as many names as possible in two minutes, then collaborate with your classmates to make a list. You could go on to make a graph to show favourites, create a poll to discover results in other classes, or show results in a pie chart or other infographic. * There have been lots of superhero-type characters in both literature and movies in recent times. Some movies also have graphic novel and other book spin-offs. Do a search of your library to find books about superheroes. * Why are so many superheroes male? How many female superheroes can kids name? Should girls only like female superheroes? Should boys only like male superheroes? Where do “should”s come from anyway? * If you could be any superhero which one would you choose? Why? * Did people long ago have heroes? Choose one to find out about. How could you tell others about this hero? * Compile a list of superhero powers. Ask your friends to pick a favourite and explain why. * If you were a superhero’s sidekick, what would you call yourself? List the qualities that make you an ideal sidekick. Write about one adventure you and your hero had from your perspective. * What if there were a superhero called Super Pickle Person, or Gladiator Girl, or Boomerang Boy? Sketch your ideas for them. * Imagine your Librarian or Teacher were a superhero. Design her/him a costume and a list of amazing powers. * If you could invite any superhero to your school, whom would you invite? What would you like them to do during their visit? * If you were a superhero, what would you specialise in? What sorts of things would you enjoy doing? Would there be anything you wouldn’t want to do? You can try creating yourself as a superhero at The Hero Factory. * Create your own superhero icons. 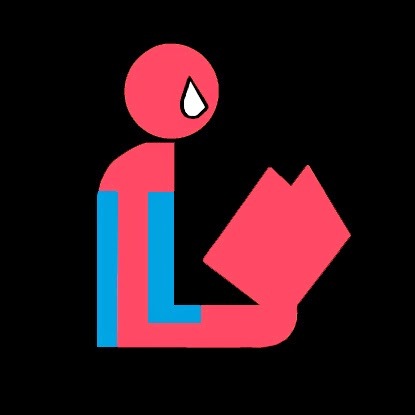 Here are some superheroes reading to give you inspiration. * What words could be used to describe a superhero? Create a word bank of superhero words. * What would be a good name for: a superhero who solved environmental problems; a superhero who rescued animals in danger; a superhero with powers that didn’t always work? Choose one hero and tell an oral story to your partner about her/him. * Use an app like Duck Duck Goose’s Superhero Comic Book Maker, an app like Strip Designer with photos you take yourself, or Comic Life software to create your own comic about a superhero. * Online image editor, PicMonkey, has a whole theme dedicated to superheroes. Take a photo of yourself and your friends, then add some special superhero elements in PicMonkey. You could use any image(s) to accompany a description of your superhero adventures. * In any discussion about superheroes, a definition of what actually makes a superhero can stir passions and polarise opinions. I quite like this definition from Dictionary.com: a hero, especially in children's comic books and television cartoons, possessing extraordinary, often magical powers. We also talk about “real life superheroes” sometimes and kids should be aware of that. * Read about some real life heroes at My Hero. * Adults could help kids create an image of themselves in a superhero pose, turn down the colour so it looks like a silhouette, and overlay it on a background. You can get video instructions for this project at Dryden Art. * Free to use! Great pics of kids in their superhero costumes doing library-related activities. * Kids can discover what kind of superhero reader they are at A Book and a Hug. * If you're teaching older kids, you might like to share this TED-Ed video with them: What Makes a Hero? Additional resources to the right of the video. * Some websites will generate images of superheroes. I particularly like The Hero Factory, pictured above, and Minimizer, pictured below. Children could generate several avatars at Minimizer and combine them into one image. They could add them to a collage to tell a story, or communicate a short message. Kids could use them to create a poster, design an advertisement to sell a product, or practise descriptive writing. These super little figures could also be used as images to promote character development for a narrative. * Lots of books have a superhero theme. These few come recommended: Elliot Midnight Superhero, the Zita the Space Girl series by Ben Hatke, Supertato by Sue Hendra, Maximum Ride series by James Patterson, Super Human series by Michael Carroll (teens). Superhero Chapter Books for Kids Aged 6 - 10. 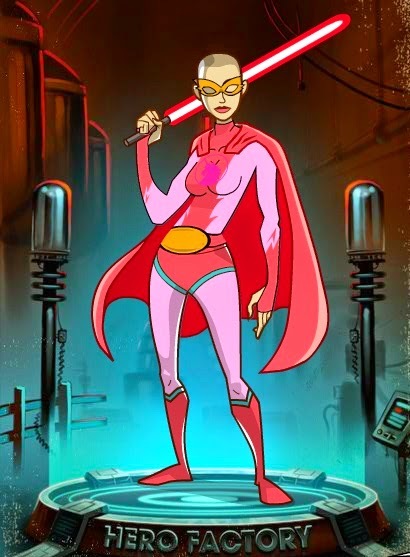 * Here’s a great app-smashing superhero project from Technology is Loose in the Library. * PicMonkey has a superhero theme (look for the apple icon in the menu at left.) Be sure to visit here if you’re helping your kids discover onomatopoeia as there’s lots of great word art! It’s also really useful if you’re trying to give an image a superhero touch, or indeed, to create that kind of image from scratch, using a blank canvas. * Scholastic have directions for a duct tape superhero mask. 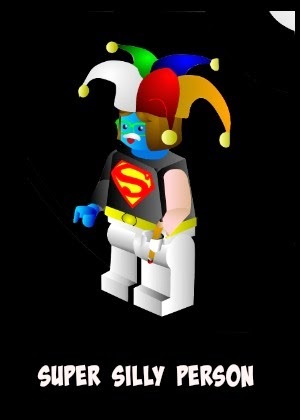 * Toy-a-Day have a great Superman/Clark Kent toy you can download as a PDF. * Find many more useful resources on Audrey Nay’s Pinterest page. 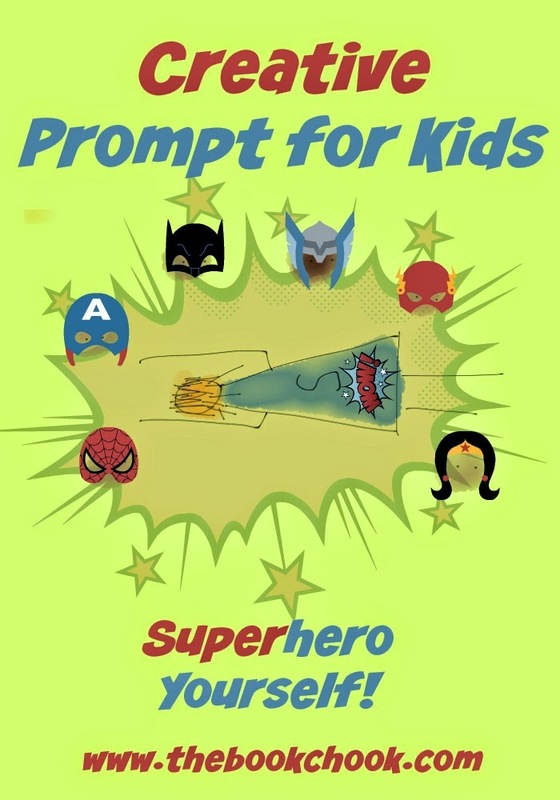 If you’re interested in superheroes, you might like to read Creative Prompt for Kids - Start with a Hero, Learning Activities for Young Superheroes and Letter to the Book Chook - Super Hero Help. I'll be adding this post to my List of Creative Prompts for Kids.